Because she started drawing at the age of two and upside-down horse— according to her undoubtedly surprised mother–, Marta Gilbert believes she may have learned how to paint in a previous lifetime. However, even if this in true and she has had the opportunity to practice her art form through past live, she admits her process of learning still has a long way to go. Although her subject matter may not change-always faces, always Indians except for commissioned portraits -every time she stands before a white canvas she hopes the next painting will be better than the previous one. Many of Marta’s models are real people, some of them are results of a combination of features and still others are draw from her dreams or remembrances. “On repeated occasions I’ve met people that I have already painted.” Although the first time it happened, she says, it was a scary experience, it has happened in so many instances that she takes it as a natural occurrence. “It is part of the process,” she believes. Marta is a dreamer. Her nights are fertile with faces, images that turn into stories and them veritable sagas that she programs herself to remember the next morning. “I paint in my dreams when I sleep and I paint what I dream during my working hours.” Actress Connie Stevens, a part-time resident to Vallarta and Marta fan, has a painting by her untitled “Dream Power Red”, a product of this magic process. Marta is not religious in a formal way; however, like her kin the Native Americans, she believes the spirit of God is found everywhere in Nature. For this reason, there is no need to go to a temple to worship It. 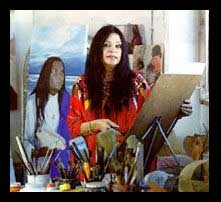 “It is enough for me to go to the jungle, stand next to a tree or look out over the ocean to have a religious experience.” It is enough for us to look at her paintings to know we stand before a rendition of her experience that encompasses the spirit of beauty. One Response to "About Marta"
We are purchasing a condo in PV and would like to buy some original art. Can you please advise as to the address of your gallery and what times are you open. We are arriving in PV to close our purchase on Sept 14th and will be there for 4 or 5 days. If you have some pictures of the art that you presently have for sale including the price, it would be appreciated if you could email them to me.